This is a very flavorful chai. But then, I expected nothing less from Yogic Chai. When it comes to flavor – Yogic Chai delivers! Their chai is not too spicy, but not too mild either… it possesses just the right level of spiciness so that you know you’re drinking a chai blend without being smacked hard in the face with the spicy flavor. Now I will admit that sometimes I like being smacked hard in the face with spice, but, when I want a delicious, evenly-spiced chai, Yogic Chai has never disappointed. This Tulsi Masala Chai takes Yogic Chai’s award winning Original Masala Chai and adds a bit of dried Tulsi (also known as Holy Basil). 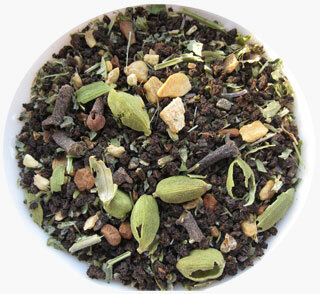 The addition of the Tulsi brings a hint of mint-like flavor that is especially noticeable in the aftertaste. It is crisp and refreshing without overwhelming the balance of spices. I like the subtle approach with the Tulsi here. It’s almost enchanting. Another delicious chai offering from Yogic Chai! During the Song Dynasty in 11th century China, tea was consumed in powder form. 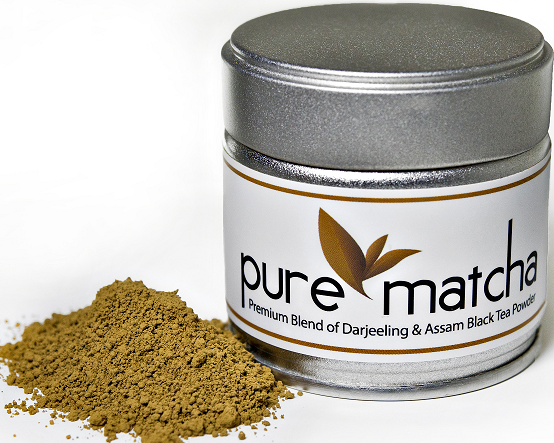 Centuries later this innovative way of drinking black tea has been reinvented with our natural 100% Black tea powder or Black Matcha. Consumed just like traditional Green tea Matcha our Black Matcha is made from the finest Darjeeling and Assam tea leaves of India, and has a robust rich flavor. 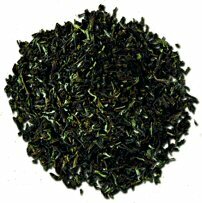 Higher in natural caffeine than a traditional cup of black tea, rivaling that of a cup of coffee. Except with Black Matcha there is no jittery crash. When you drink Black Matcha you get almost ten times more anti-oxidants and vitamins than a regular cup of tea, where the leaves are thrown away after brewing. Black Matcha is great for a healthy morning wake up. Now, I know what some of you Matcha purists out there are thinking… Matcha made from black tea leaves? But don’t knock it until you’ve tried it! This is delicious. It tastes like a very strongly brewed Assam/Darjeeling blend, heavy on the Assam. It has a lot of GUSTO. It has the maltiness that you would expect from a good quality Assam with a hint of muscatel in the background that is desirable from a Darjeeling. There is a faint savory bitter note to this, but I’ve got to tell you that I really expected it to be very bitter in a not-savory-but-bad-bitter way. This isn’t like that at all. It does, however, have a fair amount of astringency to it. It is robust with a well-rounded flavor. It is very creamy and when that is combined with the biscuit-y quality of it and the malt – well, it becomes rather rich and decadent! But, make no mistake, this is A STRONG TEA… so if you’re sensitive to caffeine, or even if you aren’t, you should be careful not to drink this too late in the day. However, if you are one who finds yourself dragging a bit in the morning (um… that would be ME), this is the Matcha for you! There is also a whisper of spice in the background that I am finding rather intriguing, and a very nice undertone of sweetness that I enhanced a little sprinkling of raw Turbinado sugar. A really delicious – and DIFFERENT! – Matcha! It prepares just like “regular” green Matcha: First, I sifted the dry tea (which looks a bit like dry hot chocolate mix). The water was slightly hotter than I would with a green Matcha. The water wasn’t boiling, but, it was just under a boil, whereas with green Matcha, I bring it to just about 145 degrees F. Add the water and whisk, and this froths up just like a green Matcha! I think this would also be quite nice as a latte, in fact, I think I shall have my next cuppa with steamed milk instead of water to see how that works out! I will update in the comments when I try it! In the meantime, you should try this tea! Very biting tea smoothed over with a caramel smile. Great to wake up to, especially if you are dropping the coffee habit. Great for the early morning attitude enhancement with the added benefit of enabling you to think beofre you speak. 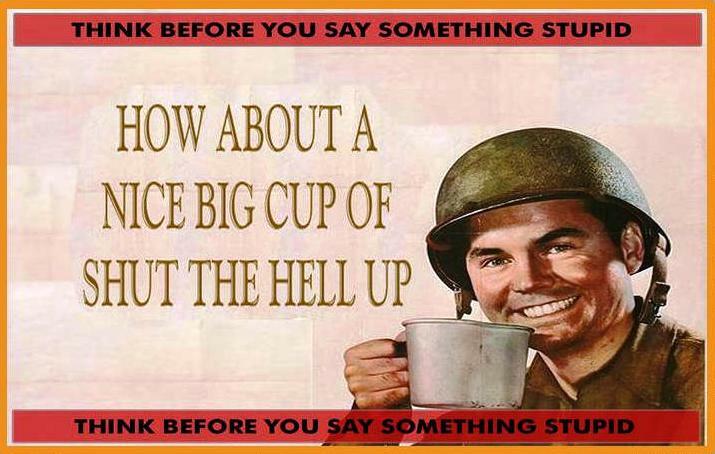 Shut the hell up and give it a try. As some of you may know, I’m not particularly fond of Lapsang Souchong so I generally avoid them whenever possible. I find the strong, smoky character of a typical Lapsang Souchong to be rather off-putting. However, I am slowly developing an appreciation for strong, smoky teas such as Lapsang Souchong, but, suffice to say that while I am usually willing to try a tea with Lapsang Souchong in it, it is not something I probably would want to try. But that all went out the window when I saw the name of this signature blend from Adagio Teas (created by Travis Pelt). I knew I had to try it! And I really am glad I did – this is actually really good. The tea is very strong – ROBUST! But what makes this tea especially good to me is the balance of tastes. It is a smoky tea, but it isn’t too smoky. It is, in fact, one of the most thoughtful blends I have encountered – and by that I mean that the underlying caramel-y notes of the Lapsang Souchong are highlighted with the addition of the caramel flavored black tea. The sweet, creamy notes of the caramel are enhanced by the malty notes of the Assam. The three types of tea create a very harmonized and yet hefty blend! It is a little chewy and has a nice bake-y taste. It makes a perfect morning tea, but I am actually enjoying it later in the afternoon at the moment – it is the perfect accompaniment to Dulce de Leche cookies from the Girl Scouts! YUM! Pour the night sky into your cup. 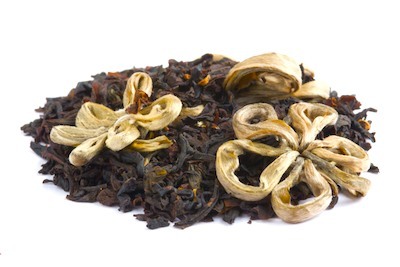 Organic Assam black tea combined with natural soothing vanilla bits along with star-shaped white tea. This is a tea that I’ve wanted to try for a long time. What can I say, I’m a huge fan of Vincent Van Gogh, and Starry Night is my favorite painting of all time. It has such beautiful emotion – the brushstrokes speak to me in a way no other painting ever has. This is a fascinating tea. 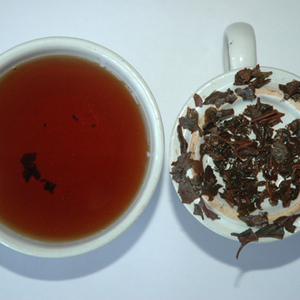 The black tea is a stout Assam, which can pose some interesting complications when paired with a white tea. I chose to steep it at a middle-ground temperature (180° F) and steep it for just 3 minutes. The result is delightful! Although I don’t get much noticeable flavor from the white tea (that’s not to say I cannot taste it because it’s there, but it is something that I really need to focus on intently to detect it), the Assam tea is so deliciously flavorful that it would seem rather ungrateful to be complaining about the white tea not being prominent. There is a rich malty tone to the Assam – and it has been flavored with vanilla and the vanilla lends a creaminess to the malty note that is rather irresistible! 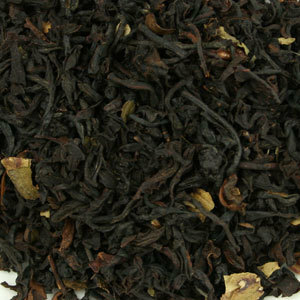 This is an excellent, full-flavored Assam that has a toothsome quality to it and a hint of baked flavor in the background. A smooth, bold tea that despite its name, is not a tea that I’d recommend sipping in the evening – unless drinking a strong, caffeinated tea in the later hours of the day would not keep you stirring at bedtime! It would take the additions of milk and honey very well, although it is quite nice without them too. I personally like my Assam tea with a drizzle of honey or agave nectar because it can be a little harsh without sweetener, but, with the vanilla here, it doesn’t really need it! It definitely has an EDGE to it, but, it isn’t hard to handle.